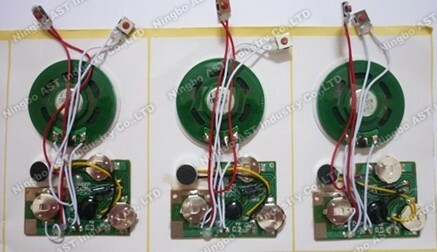 Product categories of Sound module, we are specialized manufacturers from China, Sound Module, Recordable Sound Chip suppliers/factory, wholesale high-quality products of Recordable Sound Module R & D and manufacturing, we have the perfect after-sales service and technical support. Look forward to your cooperation! 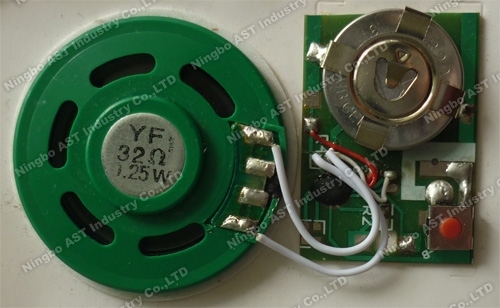 Ningbo AST Industry Co.,Ltd has 17 Years Experiences to produce the Recordable Sound Module, Sound module, Sound Chip, voice module, Recordable Sound Chip,Musical module and other electronic modul. we can assure you of competive price,high quality,prompt delivery and technology supporting. Sound Module is one kind of electronic product which mainly applied for Greeting cards,Christmas cards, promotion gifts, kids books, newspapers, magazines or other products which have sounds. A. Pre-record Sound Module ----The clients will provide their sound files to us as MP3 or Wav Format,Then we programme them into the Sound module,it will play the customized message. 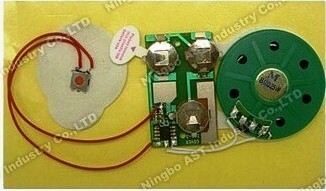 B. Recordable Module ---also called Self-recording sound chip,we can record our own messages and playback them. Of course,the message can be erased and re-recorded. C. Melody module --Which can play the Melody of the Happy Birthday,Merry Christmas,Slient Night and so on. E. Programmable Voice Module --Also can be called DIY Sound Chip,We provide the software and Programable Machine and the Clients can be programmed them at their office,factory or Home. Which is much suitable to small order quantity,but Prompt delivery order. F. Waterproof Music Module --which usually are used by Children Cloths,Kids'Bib ,attract the children's attention or Sing the children's songs. 1) Pull String -- Pull the string to activate the sound. 2) Slide tongue,usually was used by greeting cards,open the cards,it will play the message automatically. 6) shadow sensor,if somebody walks front it,it will play the message. 7) Motion sensor,usually was used by Pop Display, advertising board and so on.when somebody walks front it,it will play the message. 8) PIR (Infrared sensor),usually was used by Pop Display, advertising board and so on.when somebody walks front it,it will play the message.